Start out strong this summer by protecting your shelter and your friends and family with this Caravan 15 foot, 250 Denier Polyester Sidewall. 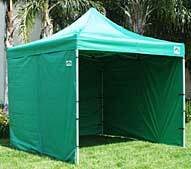 This is a simple item that, when added to your existing shelter, can provide a lot of protection and a ton of fun to your outdoor celebrations. All you have to do to attach this 15-foot sidewall to a 15-foot wall of your appropriately sized Caravan canopy is to use the included Velcro fasteners to affix it to the legs and frame top. This stable, secure connection will allow you to take advantage of the wind resistance, water resistance, and UV protection a sidewall provides. Plus it adds a touch of added privacy for people who need it. You can even completely enclose your canopy by attaching this wall to a complementary set of other sidewalls (which must be purchased separately) using the handy zippers on the vertical edges of this product. Zipped together with others or all by itself, this is an accessory that offers shelter owners a lot of options. Among those options are many that involve added protection, added comfort, and added privacy for you and your guests. If you're planning to enjoy an outdoor celebration or event, you should check out this Caravan 15 foot, 250 Denier Polyester Sidewall first to see all of the benefits and protections it can bring to the party. WARNING: This product can expose you to chemicals including Diethylhexyl Phthalate, which is known to the State of California to cause cancer, birth defects, or other reproductive harm. For more information go to www.P65Warnings.ca.gov.